Why Australians cannot get enough of Italian wine! We recently exhibited at the Italian Wine and Food Festival. Its an annual event in Melbourne and Sydney and we love taking Sensi Wines there and showcasing them to the eager public who are craving knowledge and understanding of Italian Wines. One common theme is how people can drink 2-3 bottles in a group and not walk out looking drunk or 'loose' but quite happy and relaxed. Everyone was eating pizza or salami sticks or whatever else and really enjoying each others company. This is why Australian's are going nuts for Italian wine right now. It's about Lifestyle. It's about the long lunches with family. It's about aperitivo, where you don't drink unless there are snacks in front of you. It's about exploring new flavours and tasting something different... Italian food offers that to people. There is something about Italian wine that connects us with the old world, to history. There is romance in Italian wine and people are really starting to love it! It's also, hands down, the BEST wine to go with food. They are soft, elegant and easy to drink. They have high acidity and high tannin which cleanse the palate after every bite of food and really, they feel like a meal in a bottle! You can 'chew' on Italian wines which make them mouthwatering and have a 'I have to go back for more' quality. There is so much to learn as well which makes Italian wines so interesting to Australians. Have you tried Italian wines yet? Do you know the difference between Barolo and Brunello? Do you know what Sicily produces compared to the Valle d'Aosta? Do you know the difference between Primitivo and Sangiovese? Vernaccia and Bardolino? There are 1300 native grape varietals in Italy yet 3300 grapes actually grow there. It's an education in wine, history and more. To say I love exploring Italian Varietals would be an understatement. How many have you explored? Let me know in the comments below. New to Italian wine? Give this mixed case a try! 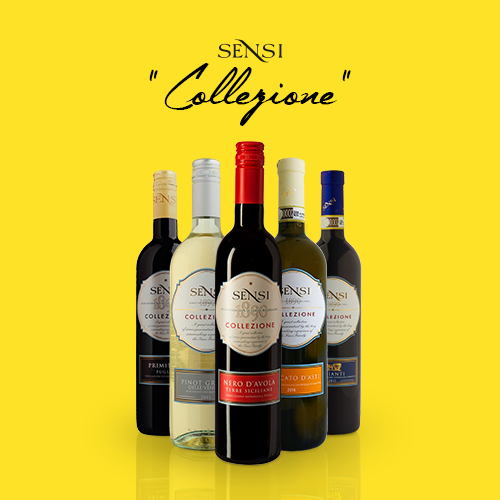 Try the Sensi 'Collezione' range now! It truly is the perfect introduction to Italian vino! From Veneto, to Tuscany, and as far south as a Abruzzo. These are delicious, easy drinking wines than pair perfectly with most foods. Enhance your next pizza night, or enjoy a beautiful Tuscan Sangiovese along side a gorgeous antipasti! You won't be disappointed!